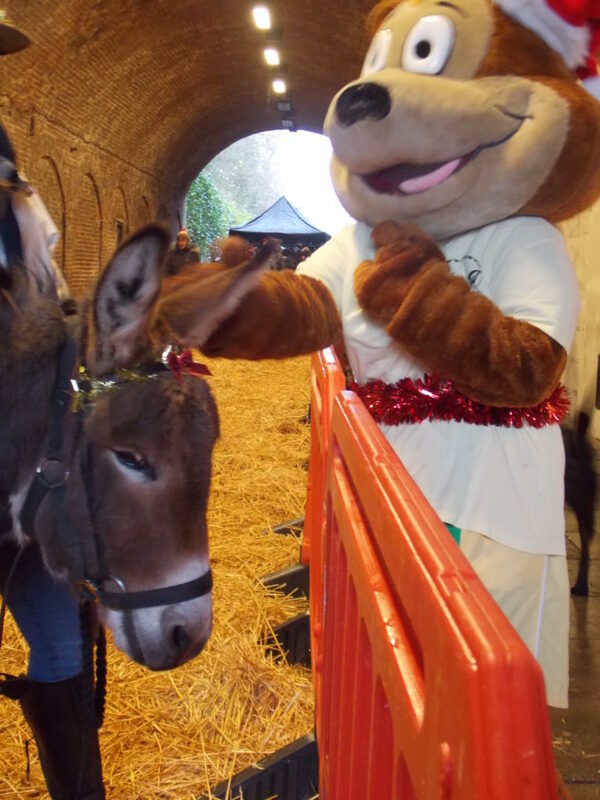 Chesney the Chipmunk and Valentine the donkey go caving in Reigate. Peter Burgess was there to record the occasion! Cavers do some pretty daft things at times. 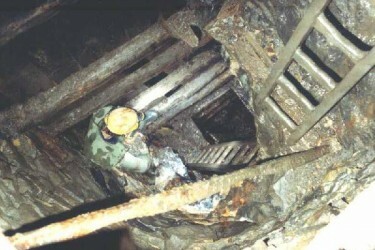 Spending hours on end in cold gloopy mud, digging out blocked passages that you can barely fit through even after you have forced your way into them, or walking up onto cold, rainy and windswept fells just to get underground would classify as pretty daft in the minds of many people. 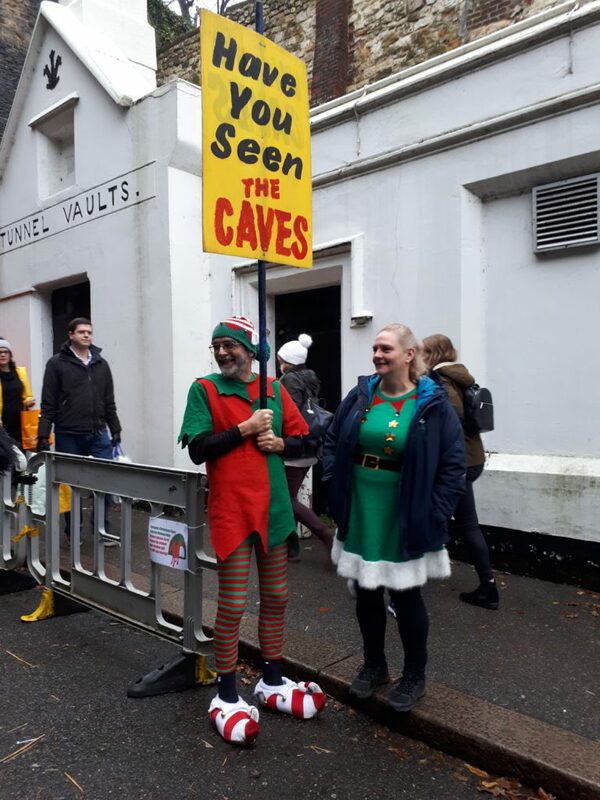 Given that the public expect cavers to be mad, members of Wealden Cave and Mine Society (WCMS) try not to disappoint each year in the weeks before Christmas. There is an annual Christmas fayre organised by the Reigate Business Guild, which is primarily a large fair held in one closed-off street in the centre of the town. Alongside the fayre, one of the local Rotary groups usually sets up a Father Christmas grotto at one end of the historic road tunnel in Reigate, and arranges for children to be carried to the grotto on donkeys to get a present. 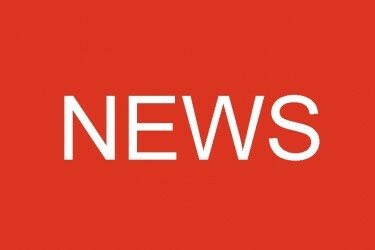 As the entrances to Reigate Caves lie within Reigate Tunnel, WCMS has been in the habit of opening one of the caves during the event and allowing families to look around at no charge, in the spirit of the season. Members have tried various ideas to make the caves feel Christmassy, such as playing seasonal music or adding a few decorations. In recent years we have hit upon the idea of dressing up as elves and fairies, and this appears to be the most successful way to entertain visitors, giving us plenty of scope to be silly, not only in the caves but also around the town. 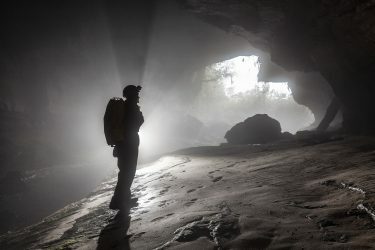 Visits to the nearby supermarket looking for the elf products aisle or seeking out Fairy Liquid from the detergent shelves, while encouraging people to come to see the caves, always raises a smile or two. Suddenly emerging from dark corners of the cave is guaranteed to get the youngsters squealing, and even sitting quietly on one of the wartime toilets panders to visitors with a more lavatorial sense of humour. On one occasion a parent was heard to explain to her children that they supposed even elves had to use the toilet sometimes. The entertainment appears to be appreciated as there is always a reasonable amount of cash in the donations box at the end of the day. This year, the Rotary group had to pull out at the last minute and the Reigate Business Guild stepped into the breach, making sure everything went ahead as advertised. Unfortunately this left them without adequate lighting and WCMS were able to provide lanterns used by visitors to the summer open days as a substitute. One member offered her services leading one of the donkeys, a role for which she was well suited being a horse-owner herself. What the donkeys think of it all, we may never know. They tend not to say a great deal!